Insulin is an essential hormone controlling blood sugar levels. Type 1 diabetes and LADA are autoimmune forms of diabetes, meaning that the body’s own immune system, for unknown reasons, destroys the pancreatic beta cells in the body that produce insulin and regulate blood sugar. Upon diagnosis of type 1 diabetes, only 10-20 percent of the patient’s own insulin-producing capacity remains. This life-threatening stage requires hospitalization and immediate insulin treatment for survival. Insulin must be administered daily by means of injections or an insulin pump to sustain life. To decrease the risk of acute and long-term diabetes complications, blood sugar levels need to be kept in balance. Both very high and low blood sugar levels are extremely dangerous and can lead to serious complications and death. Blood sugar tests 7-10 times daily help keep the insulin treatment on track. Preserving the body’s own ability to produce insulin may decrease the risk of complications among type 1 diabetes patients by 60-80 percent. Diamyd Medical is dedicated to finding a way to prevent, treat and cure autoimmune diabetes. The immune system’s attack on the beta cells starts long before clinical symptoms of type 1 diabetes have appeared, but can be detected in the bloodstream before diagnosis by testing for the presence of certain antibodies, including GAD antibodies. Diabetes is a widespread chronic disease rapidly increasing globally, characterized by fluctuating levels of glucose in the blood caused by the body’s inability to produce or respond to the hormone insulin. People with diabetes often develop serious complications resulting in great suffering and premature death. There are several types of diabetes. The most common variants are type 2 diabetes and autoimmune diabetes, i.e. type 1 diabetes and Latent Autoimmune Diabetes in Adults (LADA). The autoimmune forms of diabetes, type 1 diabetes and LADA, arise when the body’s own immune system attacks and breaks down the insulin-producing cells in the pancreas, resulting in insulin deficiency and inability to control blood sugar levels. Type 1 diabetes usually occurs in children and adolescents while LADA strikes during adulthood with a slower disease progress. LADA is often incorrectly diagnosed as type 2 diabetes. Type 2 diabetes is by far the most common form of diabetes. In contrast to autoimmune diabetes, type 2 diabetes is often characterized by insulin resistance, meaning that produced insulin does not have the intended effect in the body, and an impairment of insulin secretion by pancreatic beta cells. 425 million people in the world have diabetes today and this number is expected to rise to 629 million by the year 2045, of which 10-20 percent are anticipated to be diagnosed with autoimmune diabetes. 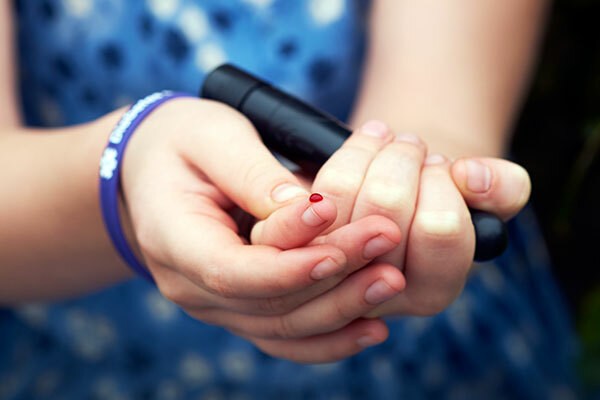 More than a million children and adolescents have type 1 diabetes and approximately 132,600 children and adolescents are diagnosed with type 1 diabetes every year. The Nordic countries have the highest incidence of type 1 diabetes in the world. In Sweden, two children are diagnosed with type 1 diabetes every day. The disease has a significant impact on the lives of those affected and their family members. It is usually a traumatic experience for the whole family when a child develops type 1 diabetes. It is still unknown what triggers the autoimmune attack leading to type 1 diabetes, although risk factors such as family history of diabetes, genetics and some viral infections have been identified. The beta cells are gradually destroyed during a period that varies from months to several years before any clinical symptoms appear. Children and adolescents with type 1 diabetes usually are diagnosed when just 10-20 percent of the beta cell function remains. Type 1 diabetes can be detected before any clinical symptoms occur by a blood test revealing the presence of specific autoantibodies, including GAD antibodies. The presence of two or several autoantibodies is ctive of the future clinical diagnosis of the disease. The exact cause of type 2 diabetes is not yet known. In some patients, the cells’ insulin receptors do not function properly, while in others the insulin-signaling mechanism is defective. However, the body's own insulin production is initially considered to be functional in these patients The disease is also characterized by a varying degree of impairment of insulin secretion by pancreatic beta cells. Type 2 diabetes is the result of a combination of many triggering factors such as heredity, lifestyle and environment. Type 2 diabetes primarily affects adults, but today more and more children are also developing the disease. Approximately 10 percent of all patients diagnosed with type 2 diabetes actually have the autoimmune LADA. There is currently no cure for autoimmune diabetes and the disease cannot be prevented. To survive type 1 diabetes, intensive treatment with insulin is needed every day for life, either through injections or an insulin pump, and the blood sugar must be checked 7-10 times daily. Changes in diet and exercise can prevent and improve many aspects of type 2 diabetes, but the progressive disease often requires permanent oral medication or insulin treatment. People with diabetes often develop serious complications which can affect several different organs in the body resulting in great suffering and premature death. Life expectancy is lower in diabetes patients than in healthy individuals, especially when diagnosed at an early age.